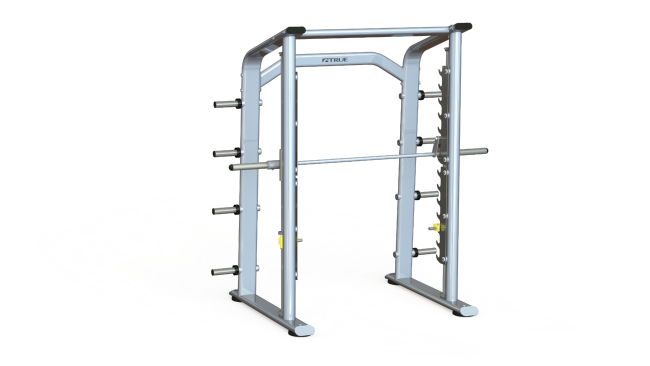 Paramount XFW 6800 Smith Machine – Tower Fitness Equipment Services Inc. Weight carriage counterbalanced to 10 lbs (4.5kg) and angled 3 degrees to accommodate natural rotation of anatomical joints during exercise. The new XFW-6800 Smith Machine from TRUE Fitness Technology features modern styling and high-quality commercial construction. The open frame design with elevated head clearance provides for easy access and movement of utility benches. Counterbalanced to 10 lbs (4.5kg), the weight carriage is angled 3 degrees to accommodate the natural movement of anatomical joints during exercise. Adjustable safety stops and 8 storage posts are standard.